Whether you’re a stay-at-home mom or a working mom, chances are you’ve got a lot on your plate. The last thing you need is to add another entry to your already overflowing to-do list. But what if an added task or two each week could lead to extra money without having to take up precious family time? If it sounds too good to be true – it’s not! Thanks to flexible freelance service offerings, busy moms can sell services that can be completed whenever the timing is right, whether that means naptime, bedtime, or anytime in between. In general, freelancing is flexible. As a freelancer, you get to pick and choose the projects you work on and when you work on them. But this doesn’t mean one freelance service is as flexible as the next. The most flexible freelance gigs typically have one thing in common: The freedom to work whenever, as long as work is completed on time. In other words, there’s no daily time commitment or specific constraints tying you to your computer for hours on end. Instead, you simply work whenever you can to get the job done. Social media can be a time sapper. If you use it personally, you know how easy it is to get lost in pinning, posting, and tweeting. Businesses get lost in the social media shuffle too. That’s why everyone from one-woman bloggers to big-name companies and brands turns to social media managers to help them make the most of their online presence. This includes things like setting up a knockout Pinterest profile, scheduling posts for Facebook and crafting perfectly worded tweets. For busy moms, freelancing as a social media manager means you can use popular automation tools to your advantage. Schedulers like Hootsuite, Buffer, Edgar, and Tailwind can be used to give your clients a near-constant online presence and help them reach new audiences. With these tools on your side, you can easily knock out a week’s worth of social schedules and updates in one night, no problem. This gives you more time with the kiddos while still taking care of your clients. To be competitive as a freelance social media manager, consider setting up a freelance service site. There you can blog about the benefits of social media marketing and showcase your services to potential clients. If you’d like to take a more hands-off approach to finding work, check out larger social media marketing companies that contract with freelancers, like Crisp Thinking or Metaverse. Both companies are known to hire freelancers to work on a variety of social media projects for both long-term and short-term gigs. There is a huge demand for content, especially online. With approximately 1 billion websites in existence, that’s a whole lot of copy making it onto screens each and every day. And a lot of times, the bloggers, and business owners behind these sites simply do not have the time to write every single word that goes live. That’s where you can come in as a freelance writer. As a mom, you can use your existing skills and interests to break into your preferred niche. If you have a sales experience, consider B2B writing or copywriting. A background in retail could lend itself well to writing reviews or product descriptions for e-commerce shop owners. Previous positions held in the legal arena can help you land writing gigs for lawyers, law offices, and large legal departments. 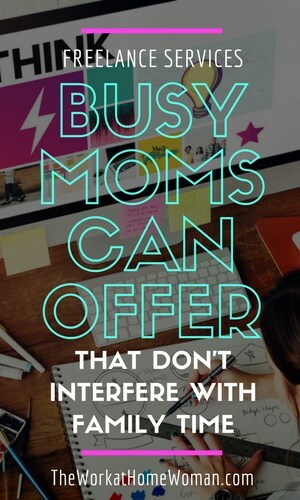 No matter what they are, when you play to your strengths and interests, you spend less time researching and more time writing – the perfect way for busy moms to sneak in a writing assignment or two around their family’s schedule and not the other way around. There are a lot of directions you can take to find paid writing gigs as a freelancer. You can market your services directly to potential clients by sending cold emails or networking on LinkedIn. You could sign up for so-called content mills and log in anytime, day or night, to see what work is available. Or you could browse job postings on popular job boards like ProBlogger to see if any listings pique your interest. If you’re not much for writing but love the written word, proofreading may be a better freelance fit for you. From eBooks to academic papers to website copy and even court reporter transcripts, there is no shortage of work to be found as a freelance proofreader. For moms with limited time, you can work on a per-project basis with a deadline in mind. This allows you to pick up projects that you can handle without having to place family life on hold. Set up a profile on Upwork to find plenty of one-off projects or browse through these companies that routinely hire freelancers to add to their pool of proofreaders. Have an eye for design? Use it to your advantage as a freelance graphic designer! 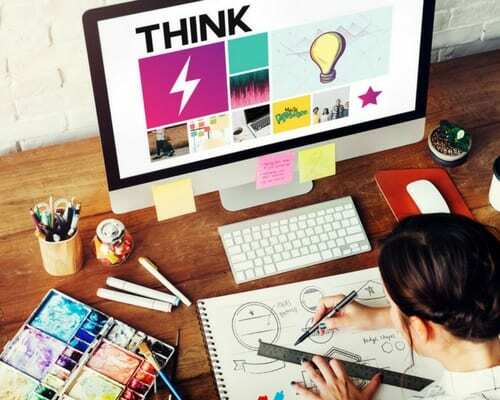 Your talents can be used to create everything from print marketing materials to online infographics and everything in between. You don’t necessarily need professional experience to get started. Thanks to user-friendly online design platforms like Canva and PicMonkey, you can create blog post images, invitations, and even logos in just a few clicks. Graphic design services do well on Fiverr where you can set up shop as a freelancer and sell simple services. As a busy mom, the key is selling gigs that can be completed in a matter of minutes. For example, offer to create highly ‘pinable’ images for use on Pinterest, a task that is in-demand and can be done quickly and easily. And Fiverr is great for busy freelancers since you can put yourself in ‘vacation mode’ any time you need to catch up with orders or simply want to take a step back from freelancing to focus more on family. Whether you decide to sign up for a popular freelance platform or set up your own site, remember, to make freelancing work for you as a busy mom, think about your existing skills and what you enjoy doing. Chances are you can translate what you already know into a flexible freelance service offering that makes sense for you and your schedule. Does freelancing sound like it's your dream career path? Be sure to read this post for 10 great tips for being successful as a freelancer! I am a nurse which needs to be a mom right now. What can I do at home to help my family? Any ideas ladies? Hi Leticia, Here is a list of work-at-home jobs for nurses: https://www.theworkathomewoman.com/remote-jobs-nurses/ Good luck and keep us posted! Thanks for sharing this. I got an email from someone who is looking for ideas to make money from home so she can be with her fam. Definitely sharing this with her and on social media. It’s great to see all the opportunities there are for moms. Thanks for putting this together. Have a great day and weekend ladies! This is a good article. Thanks for those tips. Im mom of two kids and i really need some wfh jobs. This article gave me some ideas, Hope so ill start working soon. Glad you enjoyed the ideas, Vani. Good luck on your work at home journey! I just have gone through your article. It’s a good read. I have been thinking whether they also provide services like freelance transcription. As many of the firms and customers have demand for freelance transcribers.